The Synth Sounds of Hall & Oates' "I Can't Go For That (No Can Do)"
Welcome to the latest installment of our “The Synth Sounds Of…" series, where we dissect and replicate musical layers of our all-time favorite pop songs. Last week, in our season premiere, we explored the grooves of the Talking Heads' "This Must Be the Place (Naive Melody)". Today, we turn our sights to "I Can't Go for That (No Can Do)" from Hall & Oates' 1981 record, Private Eyes. Fire up this earworm of a single on your turntable or smartphone, and the first thing you'll hear is an isolated drum machine track. To nail the sound, we deployed an original Roland CompuRhythm CR-78—one of the first truly programmable drum machines—and its "Rock-1" preset pattern. With a little “Vintage Tape" saturation from iZotope Ozone and some delay from the Waves H-Delay plugin, we matched the sound of the recording almost exactly. The next track that comes up in the original recording is a subtle bassline via what we believe to have been a Korg organ of some kind. For this we used the Retro Synth VST in Logic Pro X to capture the sound—and if you download one of the sessions below for Logic, Pro Tools, or Ableton Live 10, you'll find equivalent replications to play around with. 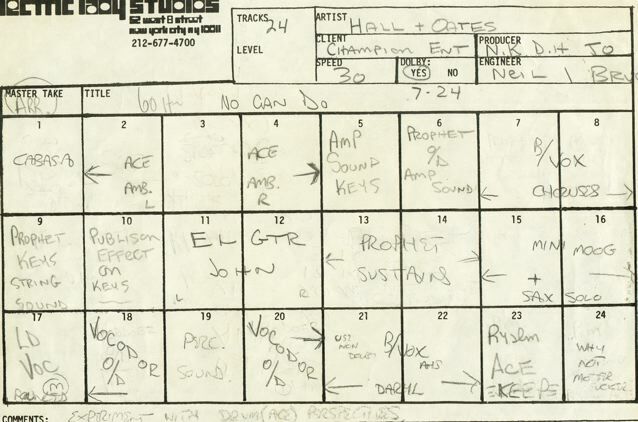 While the original recording contains a myriad of different layers and parts (as you can see in the original track sheet from Electric Lady Studios above), we focused on two of the most prominent. The distinct downward arpeggio line was recorded on a Fender Rhodes electric piano, which we emulated via a stock electric piano VST in Logic X with some chorus and reverb. Watch the video above to hear all these parts in action, and download the DAW sessions below to explore this classic set of synth sounds yourself.